Go to original pattern for design DROPS 139-18. 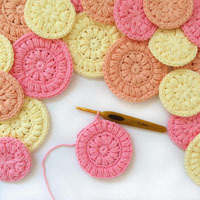 DROPS STRAIGHT NEEDLES SIZE 5.5 mm - or size needed to get 16 sts x 20 rows in stocking st with Paris = 10 x 10 cm. DROPS STRAIGHT NEEDLES and CIRCULAR NEEDLE SIZE 4.5 mm – for garter st and neck edge. * 9-9-9½-9½-9½-9½ cm 1 strand Paris, 7-7-7-7-7½-7½ cm 1 strand Cotton Viscose *, repeat from *-* a total of 4 times. NOTE: Make sure to work the same no of rows in all stripes in Paris and the same no rows in all stripes in Cotton Viscose. Then finish the piece with Paris (= approx. 9 cm). Cut the thread after each stripe, leave approx. 25 cm and use these thread ends when assembling the garment. * 8-8-8-7½-7½-7 cm 1 strand Paris, 6-6-5½-5½-5-5 cm 1 strand Cotton Viscose *, repeat from *-* a total of 3 times. NOTE: Make sure to work the same no of rows in all stripes in Paris and the same no rows in all stripes in Cotton Viscose. Then finish the piece with Paris (= approx. 8-8-7-7-6-6 cm). Cut the thread after each stripe, leave approx. 25 cm and use these thread ends when assembling the garment. Cast on 72-78-86-94-102-112 sts on needle size 5.5 mm with Paris. 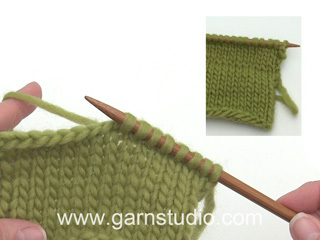 Switch to needle size 4.5 mm and work 4 rows in GARTER ST - see explanation above. Switch back to needle size 5.5 mm and continue in stocking st and STRIPES – see explanation above – but continue the outermost 3 sts in garter st for vent. REMEMBER THE KNITTING TENSION! When the first 2 stripes have been worked, the vents in each side are finished. Cast on 1 new st in each side for edge st = 74-80-88-96-104-114 sts. Work 4 rows in garter st over the outermost 4 sts in each side (and work the other sts in stocking st), then continue in stocking st over all sts but work 1 edge st in garter st in each side until finished measurements. When piece measures approx. 49-49-51-51-52-52 cm (a couple of rows in the 4th stripe in Paris should now have been worked), divide the piece in two mid front for V-neck. Slip sts in one side (= 37-40-44-48-52-57 sts) on a stitch holder. Continue over the remaining sts - AT THE SAME TIME dec 1 st towards the neck on every other row a total of 13-13-14-14-15-15 times. AT THE SAME TIME when piece measures 53 cm (in all sizes), cast off 1 st in the side for armhole. After all cast offs and dec are done, 23-26-29-33-36-41 sts remain on shoulder. Cast off when 9 cm in Paris have been worked at the top. Now piece measures approx. 73-73-75-75-77-77 cm. 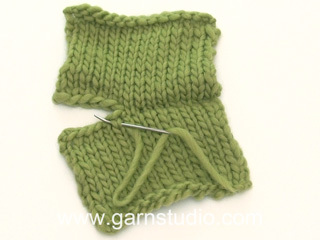 Slip sts on the stitch holder back on needle and work as first side but with dec and cast offs in the opposite side. Work as front piece but do not dec for V-neck. When piece measures approx. 71-71-73-73-75-75 cm (2 cm should remain of last stripe with Paris), cast off the middle 24-24-26-26-28-28 sts for neck. Finish each shoulder separately. Continue to cast off 1 st on next row towards the neck = 23-26-29-33-36-41 sts remain on the shoulder. Cast off when same no of rows in Paris has been worked as on front piece. NECK: Start mid front and knit up approx. 128 to 136 sts (divisible by 4) with Paris around the neck on circular needle size 4.5 mm. Then work back and forth from mid front as follows: First K 1 row from WS and then K 1 row from RS. Work next row as follows from WS: 1 st in garter st, * P 2, K 2 *, repeat from *-*, finish with P 2 and 1 st in garter st. From RS as follows: 1 st in garter st, K 2, P 2 etc. When neck edge measures 3.5 cm, cast off with K over K and P over P. Place right side of neck over left side of neck and fasten neatly with stitches in sts in garter st from both RS and WS. 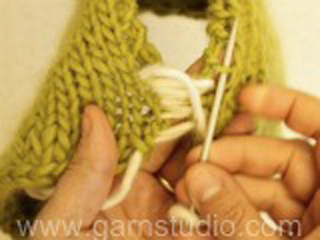 Knit up along one armhole (i.e. from where the one st in the side was cast off): 64-64-70-70-76-76 sts with Paris on needle size 5.5 mm. Then work in stocking st with 1 edge st in garter st in each side and STRIPES – see explanation above. AT THE SAME TIME when sleeve measures 2 cm, dec 1 st each side (dec from RS inside edge st by K 2 sts tog). Repeat dec every 3½-3½-2½-2½-2-2 cm a total of 10-10-12-12-14-14 times = 44-44-46-46-48-48 sts. 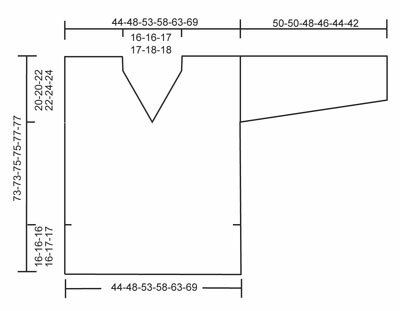 When sleeve measures 48-48-46-44-42-40 cm (shorter measurements in the larger sizes because of broader shoulder width), switch to needle size 4.5 mm. 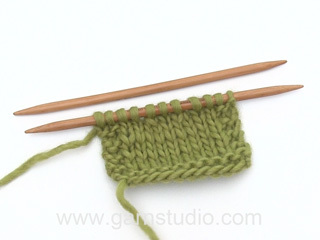 Work 4 rows in garter st, switch back to needle size 5.5 mm and loosely cast off. Work another sleeve the same way along the other armhole. Sew sleeve and side seams in one inside 1 edge st. Use the threads that were cut off for each stripe. NOTE: Remember the vent at the bottom in each side. Sew tog from where 1 edge st was cast on in each side. Onko mahdollista neuloa yksivärisenä vain Paris-langalla? Kuinka paljon lankaa silloin tarvittaisiin koko neuleeseen? Hallo, wird der erste unterste Streifen vom Maschenanschlag gemessen oder erst ab den fertig gestrickten Krausrippen? Der erste Streifen wird ab dem Anschlag gerechnet, die Krausrippen gehören also schon in den 1. Streifen. Viel Spaß beim Weiterstricken! Sehr schöner Pulli, allerdings (wie bei Vivianne)stimmten die Garn Mengen nicht. Ich mußte auch von Paris ein Knäuel nachbestellen und habe von Cotton Viscose eins übrig. Sehr ärgerlich wegen dem Porto. Wäre schön wenn Sie die angaben mal ändern würden. Muß ich die Wolle Cotton Viskose doppelt nehmen, oder eine kleinere Nadel dafür? Der Streifen wirkt bei mir sehr "löchrig" im gegensatz zu dem in Paris gestrickten Streifen. Auf dem Foto sieht das nicht so aus. Mache ich was falsch? 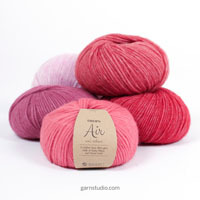 Liebe Frau Zwuck, Cotton Viscose wird weder doppelt noch mit einere kleineren Nadel verstrickt. Der Effekt ist erwünscht und Teil des Designs. Hej, jätteläcker tröja! Den del av stickning jag inte tycker om är att montera de olika delarna. Funderar på att sticka fram o bakstycke tillsammans på rundsticka när sprundet är klart och endast strunta i kantmaskorna. Antar att det inte ställer till det alltför mycket för mig? Min egentliga fråga är om jag kan göra detsamma med ärmarna? Sticka upp kring ärmhålet och sätta på strumpstickor, eller finns risken att det blir för tajt? Tack för hjälpen! Passer mængdeangivelsen? Jeg er lige færdig med første stribe Paris, og den tog næsten en hel nøgle. Garnmaengden skulle passe, men kommer du til at mangle og er din strikkefasthed korrekt, saa giv besked. Die Berechnung der Garnmenge stimmt nicht. 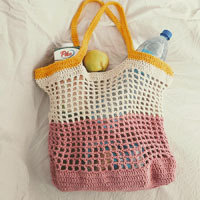 Ich habe Grösse S gestrickt und hatte einen Knäuel von PARIS zuwenig und 1 zuviel von COTTON VISCOSE!! Bitte anpassen! Är det en tråd av Paris och två trådar Cotton Viscose? Det er en tråd Cotton Viscose selv om den er Garngruppe A (delen med Cotten Viscose blir bare mere luftig).